Apple recently released iOS 12. While much of iOS 12 is about speed and tweaks, Apple also included a few new features and updated some favorites. Take Control of iOS 12 can help guide you through what’s new and updated, as well as serve as a refresher course to all things iOS. Author Josh Centers begins Take Control of iOS 12 with an extensive chapter on the new and updated features of iOS 12, which gives readers a feel for what’s to come. No need to read this book in one sitting or even in order. Check the table of contents for the topic of interest, read, learn, have fun! New to iOS 12 are Shortcuts, formerly known as the 3rd party app Workflow, and Screen Time. Screen Time helps users manage their or their family’s iPhone or iPad usage with charts and graphs that reflect how much time is spent in various apps. In addition, users can set app limits, schedule downtime, and choose a schedule for family members. If Screen Time is a feature you may use then the chapter Take Advantage of Screen Time should be open as you go through Screen Time and its options. Shortcuts is an app that automates certain actions in iOS to help users become more efficient. While Centers admittedly can’t cover all there is to know about creating and using Shortcuts, the chapter Take a Shortcut is a must-read to get a handle on constructing Shortcuts. You can be sure when I’m ready to enter the world of Shortcuts Take Control of iOS 12 will be open to that chapter to help guide me through exploring an app that has a bit of a learning curve. Family Sharing is a topic that confuses even the most savvy iOS user. Who’s the organizer? Who can be part of a family? How do we pay for purchases? The chapter All in the Family Sharing answers all those questions and more. If you’re like me and organize your photos on your Mac, using Photos on iOS can be a little intimidating as it isn’t as simple to use or create albums. Read Get to Know Photos for an extremely helpful overview of working with your precious photos. Take Control of iOS 12 is loaded with information to help users get the most out of iOS 12. It includes tips we’ve heard or read about and thought, “I have to remember that” only to forget them soon after. Lots of little tips and suggestions in this book add up to useful time savers and stress relievers. If you’re an experienced iOS user and prefer to tinker and figure things out on your own, you probably don’t need this book. 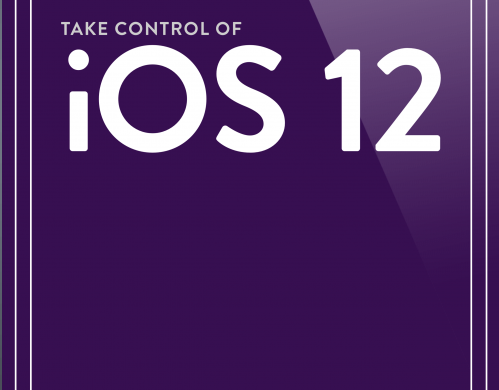 If, however, you’re new to iOS or need a little guidance to learn what’s new in iOS 12, then Take Control of iOS 12 is for you.